We have switched to a new version of silkscreen material that has emulsion on both sides and there is no obvious shiny side. 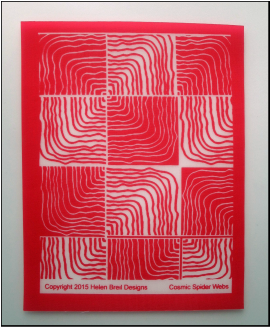 If your Helen Breil Designs silk screen is pink, you can use either side of the silkscreen when applying paint. This has the added bonus of allowing you to create mirror images of patterns by using both sides. If you purchased a blue or green silkscreen, place the silk screen shiny side down on your surface. Put a line of paint along one edge. (I recommend a heavy body paint in a tube for best results.) Pull the paint across the stencil with a squeegee or an old credit card. Remove the stencil by slowly lifting up from one side. Do not let the paint dry on your stencil. Keep a container of water nearby to place your stencil in. Gently rinse your silk screen with water using soap if necessary. Gently rub the paint off with a soft sponge if required. Do not use rough material as it may rub off the emulsion and ruin the design. Therefore care must be exercised to avoid scratching or rubbing off your design. Place on a towel or drying rack to dry, shiny side up. If several stencils get stuck together do not pull them apart. Soak the stencils in water for a few minutes until they come apart. Clean stencils with plain tap water. If necessary use latex paint remover, paint thinner or oil based paint remover. Excessive plasticizers in polymer clay cause acrylic paint to remain sticky and not dry properly. The plasticizers are what makes the clay soft, so the softer the clay the more likely this will be an issue. That is why I use and recommend Kato clay which is generally the least soft clay of the major brands. If you want to use other clays I suggest leaching the clay which may help. If your paint is not dry to the touch in about 10 minutes after silkscreening, it is not going to dry properly. And waiting longer actually makes the situation worse with the paint continuing to react with the plasticizers. I suggest getting your project completed and into the oven as soon as you can in order to stop this process. Store stencils flat, do not fold or bend. May be stored in zip-lock bags or a box. Paint not thick enough. Try using a thicker paint. Silk screen not making good enough contact with surface being painted. Try using silk screen adhesive spray. Surface being painted is too uneven. Try cutting silk screen into smaller pieces for a better fit. Taping down may help. Dried paint filling up mesh. Try cleaning silk screen (see above) before proceeding. Paint is too thick. Paint contains pigments or speckles that are too large to fit through mesh.